Springtime is here and show season has begun! It’s a time to drag and rotate pastures in preparation for summer grass. It’s also a time to get ready for the first horse show of the year. It’s also a good time to assess your goals for the year, and your mindset. What are your goals as a rider? What are your goals for your horse? What are you goals for the show season? And, the big question is do all three of those goals align? I’ll be honest, I’d absolutely love to run down the alley way at the Thomas and Mack arena at the NFR, or run a cow down the rail at the AQHA World, or jump a course at the Longines FEI World Cup. Actually, I’d love to do all three, but if i start my show season off thinking we’ll be hitting that level by the end the year, I’m going to be sorely disappointed! The pattern at the State finals. Ground was awesome! You see, just like any great horseman that’s learned from experience, Joel knows you can have the best plans in the world and the biggest dreams, and sometimes things just happen that are out of your control. For instance, you’re riding a colt at a big show and he spooks at the flash on a camera as you’re making your way along the rail and you blow your class. Or maybe you’re riding a horse that’s been hauled a lot but they spook at the second barrel when the wind flaps a banner on the rail. It happens. The key is to not let it deter you from moving forward in your goals. I’ve hauled with Joel and his wife Nancy quite a bit and I try to learn all I can about this “Low Expectations” strategy. Obviously with their track record and number of great horses they’ve turned out, there’s something to it! 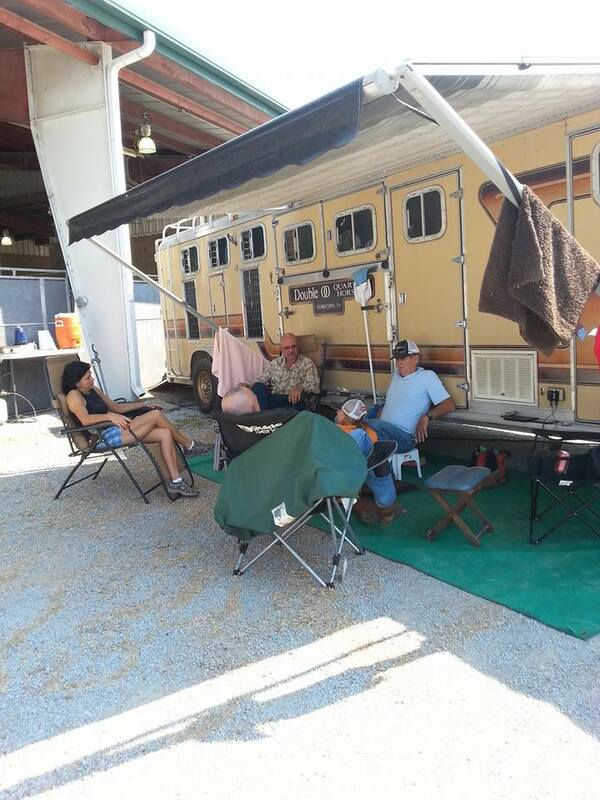 We stayed in the Sherlin’s trailer known as “The Double OO”. It’s famous! “Low Exepctations” is really a change in mindset that’s usually brought on by the school of hard knocks – sometimes literally – and disappointments. It’s a learning experience. One thing that I’ve noticed is that when you ride horses that have issues or need some training, you learn very quickly to appreciate the little things. For instance, if you a haul your horse to it’s first show and you stay on, it’s been a good day – never mind you didn’t even place! That’s “Low Expectations” in action right there. Bubba earned me THE black ribbon for the horse show for his horrendous go in Trail. The following year he won me an All Round for the day! When you’re starting a new discipline, or your new to riding in general, it’s the same thing. If you get in your class and you remember your pattern, or you make it around all three barrels still in the saddle, then you’ve had a good ride! Again, “Low Expectations”. By now, you see where I’m going with this. Sometimes you have to take a step back and look at where you’re at and what your base struggles are. Do you have trouble getting a lead? 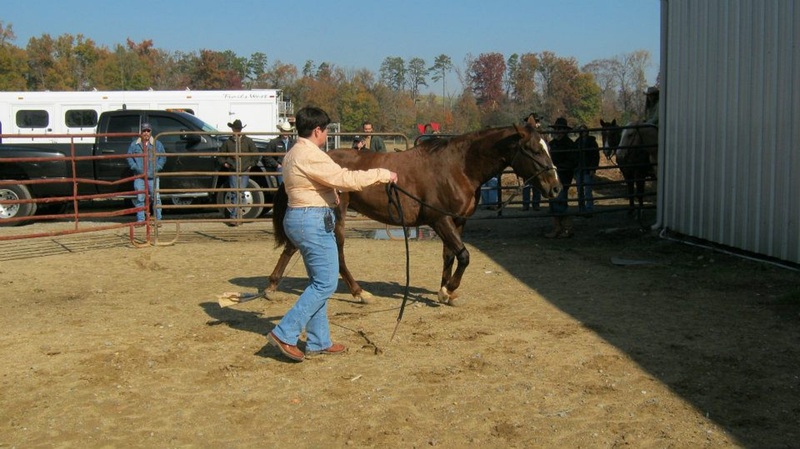 Does your horse struggle loping small circles? Do your horse spook every time you go into an indoor arena? Those are the simple things you can focus on now. Fixing foundational problems such as these will lead to much bigger successes later on. The same thing goes for us a riders. What are some of the things that you struggle with as a rider? Maybe you struggle with getting the correct diagonal at the trot, or being in time over a jump. Perhaps it’s getting left behind when you come out of a barrel headed to the next one, or just not being intimidated with speed. When you break it down, all of these things really relate to strength and balance. Just like working on foundational issues with your horse, you can work on the basic issues as a rider and improve your ability over time. As riders, we always tend to look at the end picture. What we don’t realize is that it’s all the little things that eventually produce the final success, and that’s a side effect of having a “Low Expectations” mentality. Work on those small things a little at time and eventually they all add up. 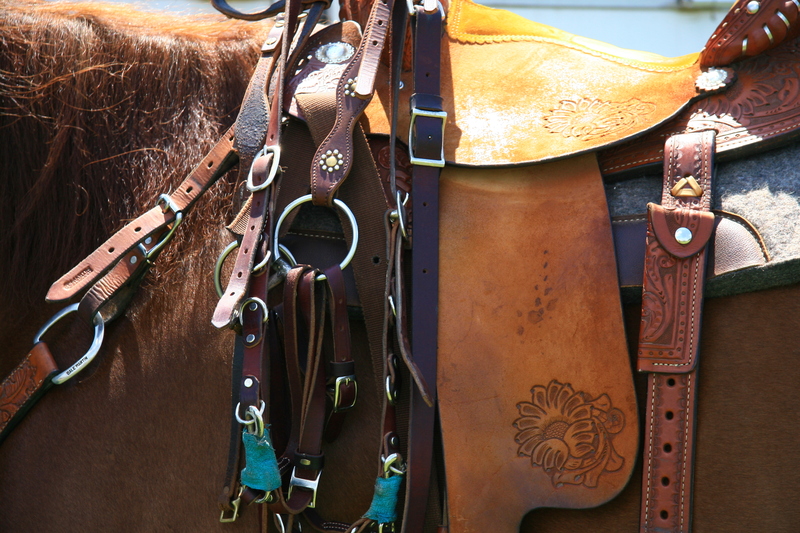 If you could do anything with your horse, what would it be? What are some simple things you can do today to improve you and your horse, and implement a “Low Expectations” strategy? For most of my life, I’ve taken that saying with a grain of salt, pun intended. However, over the last few years I’m beginning to think there’s a lot more truth to those sayings than we realize. After a bout of unanswered questions about my health – that’s another blog post in itself – I started paying very close attention to how my body reacted to certain foods. Now, I’m not talking just gaining or losing weight. I’m talking about how food effects my breathing, my sinus levels, and even my mental status for the day. After doing some experimentation, I learned that dairy and breads cause me to wheeze – that’s in addition to sinus and stomach issues. I also learned that cokes and sweets cause me to become depressed, and soy will send me into an emotional roller coaster during certain times of the month. In contrast, turkey and other meat cause me to focus and think more clearly. The same thing could be said about our thought life. When we think negative things, the impact is negative.Those negative thoughts impact our happiness, our confidence, and ultimately our performance and whether or not we pursue dreams. Recently, I read a great article on thinking like an athlete. The article stated that the main reason athletes are successful is that they see themselves as just that – an athlete. The article went on to say that when you see yourself as an athlete and get into that mindset, regardless of what your body is like, you start thinking differently in other areas of your life. You start taking training more seriously. What you eat and the amount of sleep you get become more important. Instead of those seeing those things as a means to lose weight, they suddenly become a way for you to train better and be a better athlete. How many times have you been asked what you do with your horses or what discipline you ride? Probably too many times to count. Your answer has probably been, “I just run barrels” or “I just do a little western pleasure.” That’s the wrong answer! Today, you might not be running down the alley way at the NFR or doing a sliding stop at the finals at Congress. I get that you don’t want to blow yourself out of proportion, come across arrogant, or give the appearance that you’re competing at a level that you’re not – yet! However, if you keep thinking like you always have, you’ll keep getting what you’ve always gotten. Do you spend any less money on your horse than a serious competitor? You feed the best feed, supplements and hay. 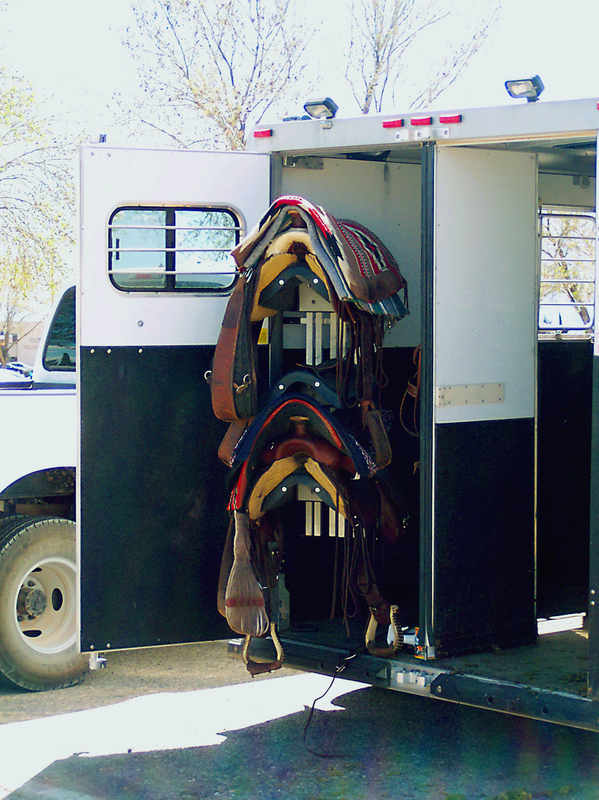 You keep a routine shoeing schedule so your horse can perform well. You take your horse to the vet every time they need it. 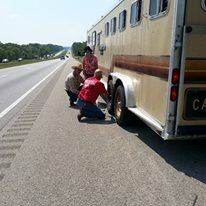 You make sure your horse is in a safe, happy environment and kept on a schedule. Do you spend any less time on your horse than a serious competitor? I know a lot of girls that compete locally and not nationally that ride their horses every single day. I also know girls that ride every free minute they can in the midst of working full time to pay the feed bill and mortgage, working second and third jobs, and taking care of families. Is the fact that they don’t get to ride as much any less worthy? There’s things that you’re probably already doing that aren’t that much different than someone rides and competes on a higher level. Don’t cut yourself short in your thinking! If you think you’re “junk”, then junk is exactly what you’re going to reap. What do you think Charmayne James or Congress champion Karen Evans Mundy thought of themselves when they were working up through the ranks? Did they think they were just a barrel racer or just a hunter rider? No! They thought of themselves as champions that just hadn’t gotten there yet. All they had to do was work a little harder and ride a little better – that’s all. So my question to you is this… If you knew for a fact that you would be running down the alleyway at the NFR, or riding the rail at Congress in two years how would that change your thinking TODAY? Would it make you see yourself differently? Would you have a new purpose every time you rode or worked out? If you’re like me, you’ve beat yourself up for far too long thinking you’re not good enough and you’re just a barrel racer, etc. That thinking hasn’t gotten either of us very far, has it? Insanity is doing the same thing over and over again and expecting different results. It’s time to do something different. It’s time to think different and see what results we get! In the end, it really doesn’t matter what everyone else thinks. It only matters what you think about yourself. There’s some good news this week! 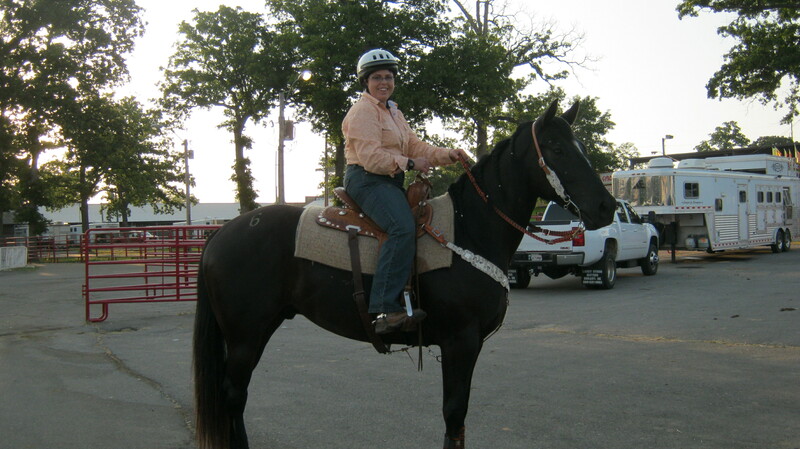 I’ve been asked to do a podcast interview about Cowgirls With Curves and some of the challenges that real size riders face when it comes to riding and competing. The interview will be in early March and I’m excited to have the chance to spread the word and hopefully make a difference in how cowgirls everywhere see themselves! As soon as I have more information, I’ll post the link here so you can listen and share. With the RFD-TV American Million Dollar Rodeo semi-finals going on, I think it’s a good opportunity to talk about attitudes. Attitudes towards ourselves and our horses, and attitudes toward other riders and their horses. Just this week, I saw yet another Facebook post saying that just because a horse and rider doesn’t run 1-D times or win money at every rodeo it doesn’t mean that they’re crap or not worthy. I’m sure the post was the result of something that was said to the poster or perhaps she overhead. Either way, it had an impact. I’ve seen the woman who posted the statement at many barrel races and ranch clinics since she was a very young teenager. While she may not have the latest greatest tack, truck and trailer, or have the most intimating blood lines, she has done well locally. 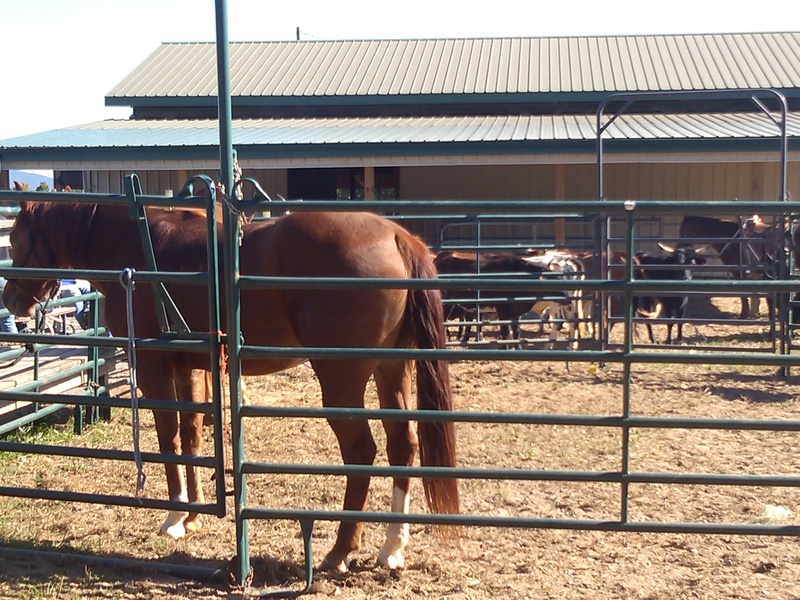 Three year old mare at her first ranch clinic fall of 2013. Now, I’d like to run down the alley way of the NFR just as much as any other barrel racer out there, or push a cow down the fence at mach nine at the ARHA National show. Heck, any national title would make me happy! Because of that, I read about and listen to a lot of national champions in the hopes of learning something and some day being in their shoes. At the same time, there’s something that this young woman has that I think all of us, no matter what level we show at, can learn from. 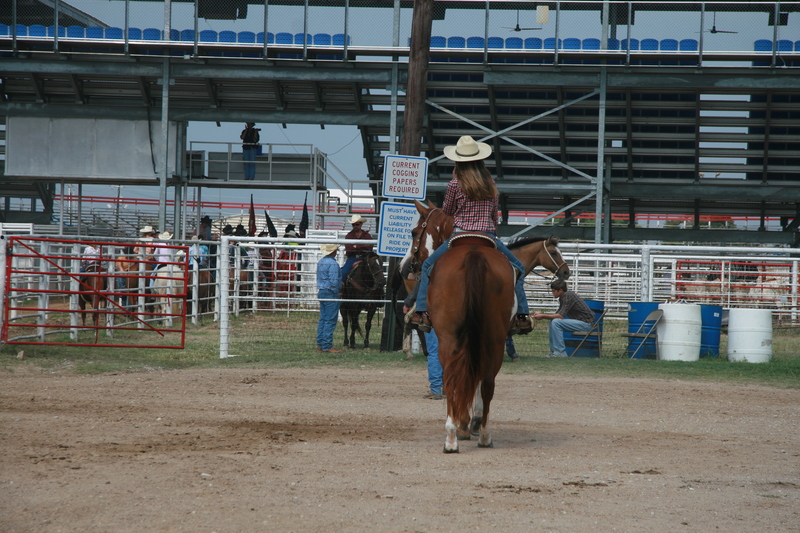 Horsemanship is very important to this young woman, which is one reason she goes to the ranch clinics. Too often I feel like the horsemanship part gets left out in the pursuit of a title. 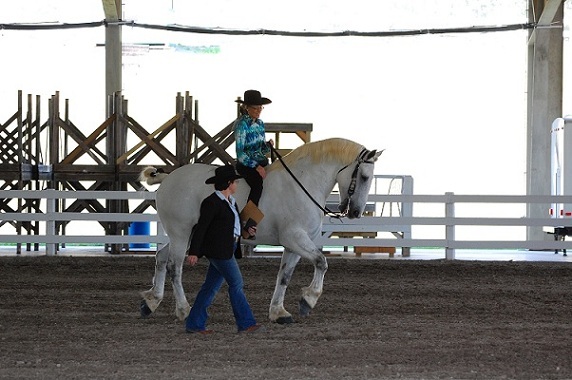 Horsemanship and the best interest of the horse always needs to stay in the forefront, no matter what. 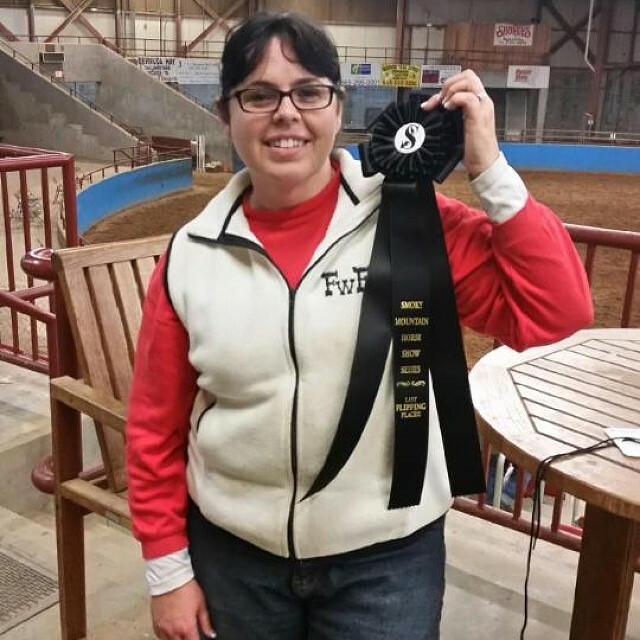 This young woman is passionate about barrel racing and she’s one of the hardest workers I know. She’s done the absolute best with what she has and it’s not been easy. Even through the disappointments and the hard times she’s managed to keep the fire lit under her dreams and keep moving in that direction. She’s always had a great attitude. The last thing is that she dearly loves her horses and she realizes how blessed she is just to have a horse in the first place – any horse! Humility and thankfulness are two things that serve you well no matter where you go. They keep you grounded and they get you through the hard times. On a side note, when it comes to humility and thankfulness, far too often I’ve seen a sense of entitlement develop with a little bit of ability or winning a title. Just because you have the horse and the ability to win doesn’t mean you’re automatically entitled. When you’re humble and you’re thankful, that sense of entitlement doesn’t rear it’s ugly head. The sad thing is that every section of the horse industry sees someone like this young woman and thinks they’re a nobody. They’re not appreciated for the qualities that they have, and no one thinks they have anything to offer or learn from because they don’t have a title under their belt. As wise horsemen say, good or bad, every person and every horse has something to teach you. Of course, in order to learn you can’t dismiss them. I have my judge’s card with the Open Horse Show Association. 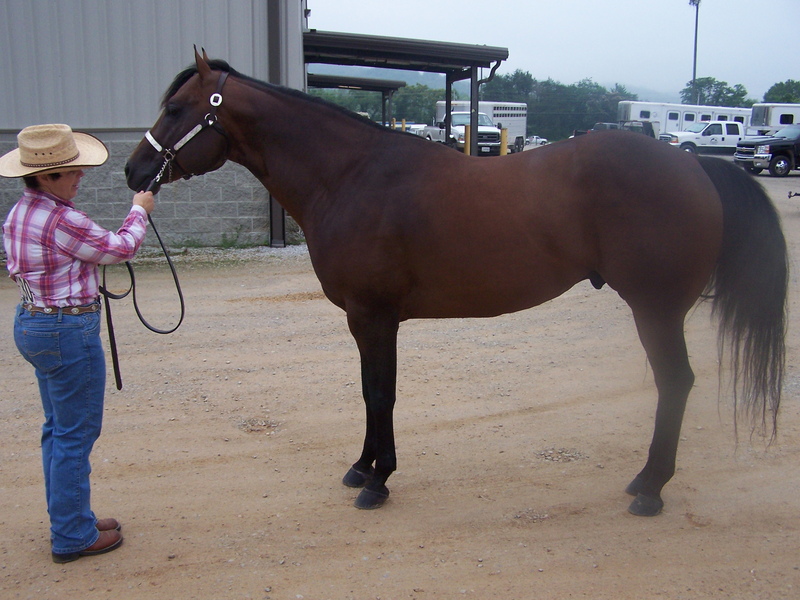 I would love to get my judge’s cards in several other large associations like ARHA, AQHA, etc. One thing that has kept me from pursuing it quite frankly has been the financial costs but I love judging open shows. The main thing I absolutely love about judging open shows is seeing people who are starting out on their own without any help. Even though they’re a complete novice when it comes to showing horses, I’m always in awe of how they remind me every single time what it’s all about. That keeps my own passion for showing and competing alive. It is also a part of what prompted me to start this site. 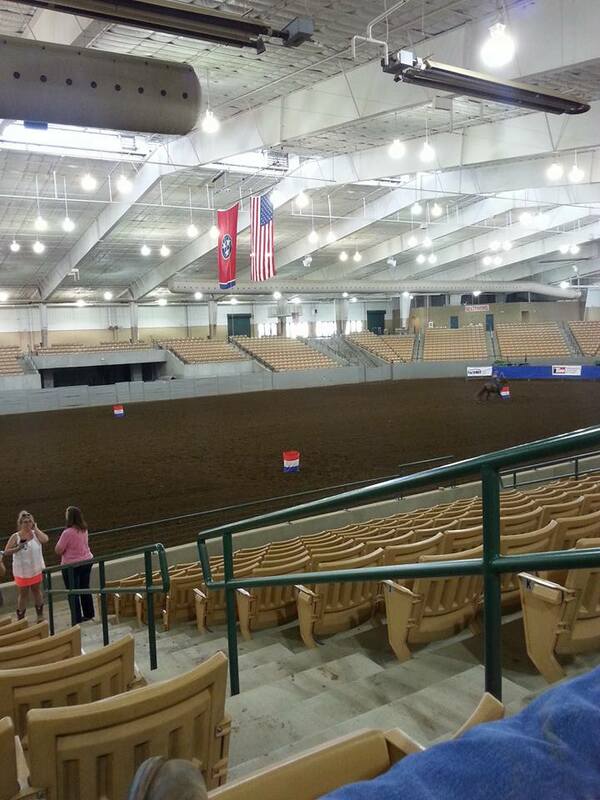 Judging at the Reinbow Riders open show at Tri-State arena in Cleveland, Tennessee. Photo courtesy of Christina Simmerman. Have you ever had an experience where someone has dismissed you as a competitor? How did that make you feel? How did you get past it?